The Differences between the Maintz and Pompeii styles of Gladius Were medieval and Renaissance swords cumbersome? 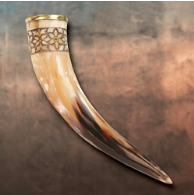 When did drinking horns originate? While there is no definite answer to this question the best guess is that, as man evolved, we needed something to hold our water and so we turned the horns of animals we hunted to drinking vessels. Horn was a versatile raw material and also used to make other products, such as combs, spoons, tool handles, and cups, apart from having symbolic significance. Though drinking horns are typically associated with the Vikings, they were not exclusive to the Norse seafarers. 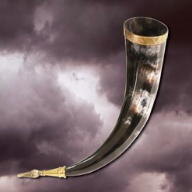 In fact, Thrace, Scythia, Ancient Greece, Rome, and the Iron Celts all had a rich tradition of drinking from horns. The Thracians, for instance, were big into drinking horns, which were made of horn and wood. Unsurprising this, as Thracians were the first known culture to challenge each other to drinking contests where horns were emptied in one go. Another tribe with a history of drinking horns was the nomadic Scythians. They often fought or traded with the Greeks and were possibly responsible for giving Greeks and Romans the idea of drinking from horns. Scythian drinking horns were fashioned from precious metal and often featured vessels decorated with metal fittings. In Scythian myth, these horns were given to rulers by a god. For a culture with a designated god of drinking (Dionysus) it should come as no surprise that horns were a major part of Greek drinking feastware. A closed horn called the Keras was a regular fixture in Greek drinking parties. Even in Greek art, there are several depictions of Dionysus drinking from a horn. Romans took this tradition a level further fashioning stunning glass drinking horns for ceremonies. 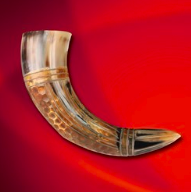 Drinking from a horn signified wealth and power. The influence of the Roman Empire meant that the culture of drinking horns spread to other parts of Europe, such as the Iron Age Celts. Iron Age Celts were a party people, reveling in mead, wine, and of course beer from drinking horns. Like the Romans, Celts considered these vessels as a symbol of abundance. Their variation was made of gold and others that were decorated with elaborate carvings and handles. To Celts, drinking horns were more than mere feastware and discovered burial sites have featured metal banded drinking horns as a mark of respect to the dead. Now to the Vikings. 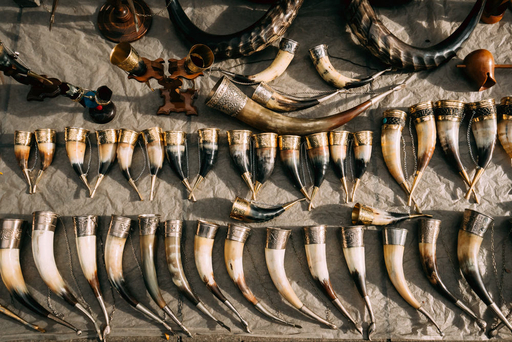 Putting Vikings and drinking horns together may conjure up images of big, rough seafarers sitting around a long table and reveling in their latest conquest. While that could be true, Viking drinking horns were associated with the ladies more than we realize. In Viking mythology, the Valkyries (female figures who chose those who lived or died in battle) were often depicted offering drinking horns to dead warriors to welcome them to Valhalla (hall of the slain). Also, a vast majority of horns discovered in Viking burial mounds belonged to female graves, perhaps because women were responsible for beading mead and serving guests. 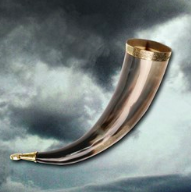 You can find more high-quality drinking horns right here at Museum Replicas.